Killer Characters: Luck of the Irish Soda Bread! Luck of the Irish Soda Bread! Hi. Once again it is March 19th , the Feast of St. Joseph, a holiday that was always cause for much celebration back in Brooklyn where Bridgy and I grew up. And by celebration I mean great food. Last year Bridgy told you how to make Sfingi di San Giuseppe, i.e., St. Joseph’s Cream Puffs, which you can find here. And the previous year I shared a recipe for Pan di San Giuseppe, i.e., St. Joseph’s Bread. Here is that link. 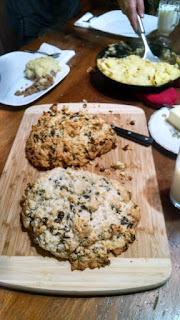 Well, having exhausted our favorite Feast of St. Joseph recipes, in honor of the recent St. Patrick's Day celebration, I am going to share my grandma’s recipe for Irish Soda Bread and will give you all the Cabot family’s favorite variations. 2. Lightly flour a baking sheet or an 8 or 9 inch round baking pan. 3. Sift dry ingredients in a large bowl. Make a well in center and pour in the buttermilk a little at a time cutting it into the flour with a knife. 4. Turn out on a floured board and knead swiftly and lightly for a few seconds. Do not over handle or the bread will be tough. 5. Place the smooth side up on the lightly floured baking sheet. 6. Cut a deep cross in the top, letting the cuts go right over sides of bread. This allows the bread to rise evenly and without splitting. 7. Bake at 425 degrees for 45 minutes or until loaf sounds hollow when tapped on the bottom with the handle of a knife. 8. Cool on a rack for a bit. 9. While still warm to the touch, wrap in a dishtowel tied with string or extra-long rubber bands to keep moisture in and the crust from getting too hard. Below I have listed some of our favorite variations. I love the Fancy Soda Bread while Bridgy is partial to Raisin Soda Bread, shown here at a family meal. You can see homemade Shepherd's Pie being dished out in the background. Hmmm, that just might be a good recipe for next March. White Soda Bread: 4 cups all-purpose flour, eliminate wheat flour. Raisin Soda Bread: sprinkle 1 cup raisins (mix of dark and golden) and 2 Tbls. caraway seeds into the dry ingredients before adding buttermilk. Fancy Soda Bread: sprinkle 1 cup chopped walnuts into the dry ingredients. Cut 12 pitted dates into thirds. (Kitchen shears cut the dates more easily than a knife.) Drop the date pieces separately into the dry ingredients as they will stick to each other if you try to drop them in all at once. I hope that you will try a soda bread--so easy to make and, slathered with butter, so very easy to eat. And please stop by the Read ’Em and Eat café and bookstore to hang out with me, Bridgy and the rest of the gang. You can find us, as well as some other terrific recipes, here: Well Read, Then Dead, Caught Read-Handed and Read to Death. That sounds marvelous! I have been wanting to make Irish Soda Bread for a while, and now I think I will! Thank you for the recipe. Love to bake and will have to definitely give your recipe for Irish Soda Bread. Love the way you can do it plain or fancy it up too depending on the occasion. I'd love to read about Bridgy and the gang! I lovee to bake and will have to try your reipe. Thank you!! I am so glad that folks enjoy Sassy's recipe for Irish Soda Bread. Anyway stay up the excellent quality writing, it is rare to look a nice weblog like this one these days..